Apologies for taking so long to get this post out, I didn’t quite finish it on our flight home and then my whistle stop tour of the UK got in the way! I think you’d be hard pressed to find a restaurant in Thailand that doesn’t have Thai curry on the menu. Whilst these curries share a common base of spicy curry paste (the main components of which are chillies, shrimp paste, shallots, galangal, lemon grass, coriander root, turmeric and kaffir lime peel lovingly pounded or blended together) and coconut milk, there are a delightful range to choose from. Red, yellow and green curries are probably the most ubiquitous and mainly differ in levels of increasing spiciness. If you fancy a blow-the-roof-off-your-mouth dish then try a jungle curry which has a serious kick. 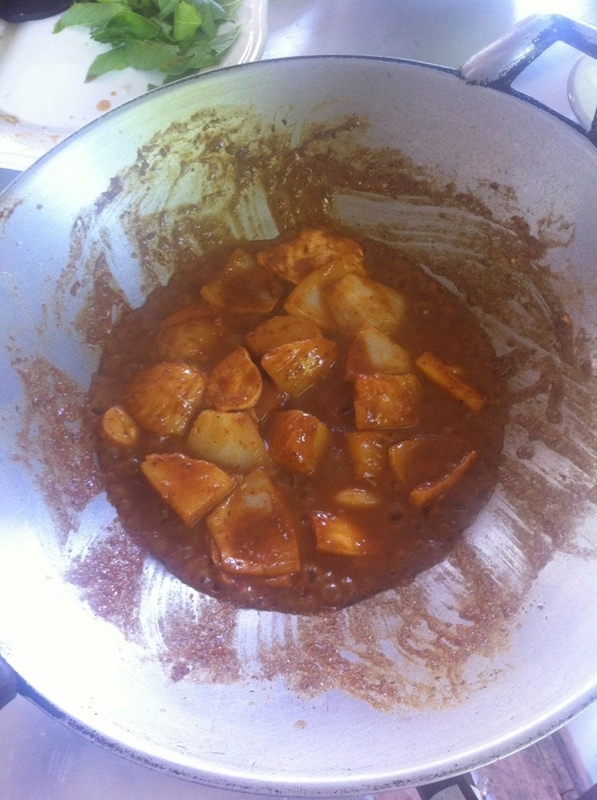 Other variants include the mild massaman and the peanutty phanang curries. With such an array of curries to try it’s surprising that we managed to eat anything else! This probably jostles with curry for the most popular Thai dish. 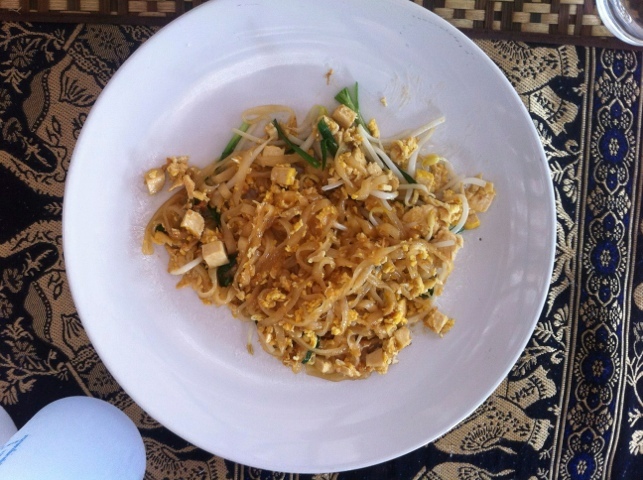 Pad Thai is an incredibly quick and easy dish to cook: flat noodles fried with egg and vegetables in an oyster- fish-soy sauce. Definitely a good meal to grab on the run. Drunken noodles are disappointingly alcohol free (yet still tasty). 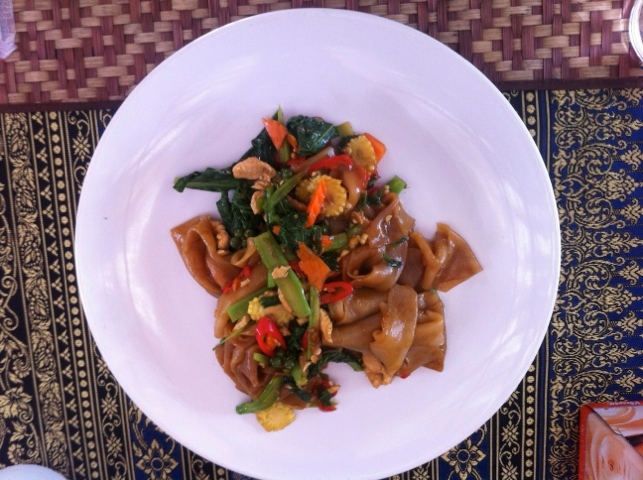 This is another noodle stir-fry that varies from Pad Thai mainly in the thickness of the noodles, with wider noodles and spicier sauce characterising this dish. 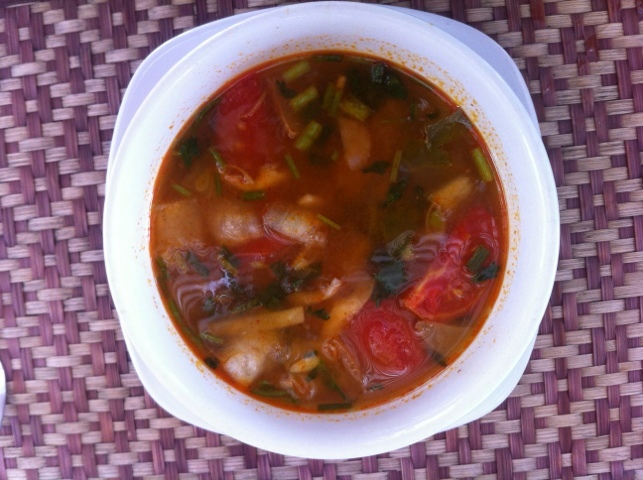 Tom yum is a delicious and surprisingly filling hot and sour soup. The fresh fragrance of lemon grass and kaffir lime leaves makes your mouth water as you bring the spoon to your lips, taking your first slurp you are immediately hit by the sourness of the lime juice, saltiness of the fish sauce and spiciness of fresh chillis and a delightful warm feeling as it slides down. This dish is fairly ubiquitous throughout Eastern Asia but has only featured now as we found a fantastic (and incredibly cheap at 35 Baht – 70p) noodle soup stall. So impressed were we by the fare served up by the lovely Thai lady at the place that we ate here three out of the four days we spent in Bangkok! This dish is pretty self explanatory, a chicken broth with noodles, vegetables, and in the case of our favourite stall pork balls (made to a forty year old recipe) and wontons. It’s even better when seasoned with fish sauce and chilli flakes. 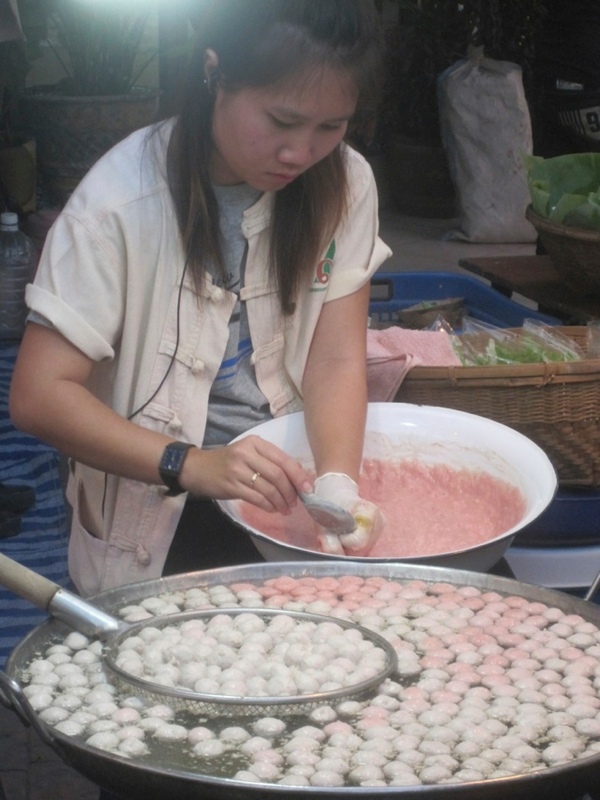 Making the pork balls for noodle soup. They taste better than they look! Many thanks go to Pey Shan’s mum who cooked most of the food we ate whilst in Malaysia and who welcomed us into the family’s Chinese new year feasts. Everything she cooked was delicious and we certainly didn’t go hungry! A steamboat is essentially the same as the hotpot described in my earlier post on Vietnamese food, a constantly heated broth to which all manner of meat, fish balls and vegetables are added and which you help yourself to until you’ve had your fill. 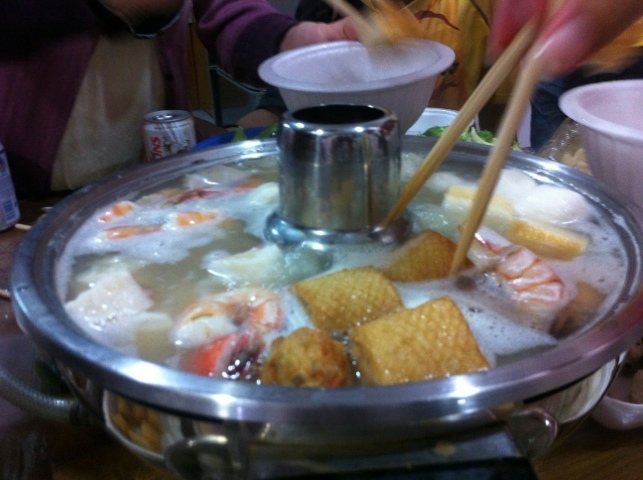 We enjoyed the true family steamboat experience on Chinese New Year’s Eve with the family gathered around the table, dipping into the steamboat at will and with several sittings to accomodate all the visiting family members, guests and their appetites! 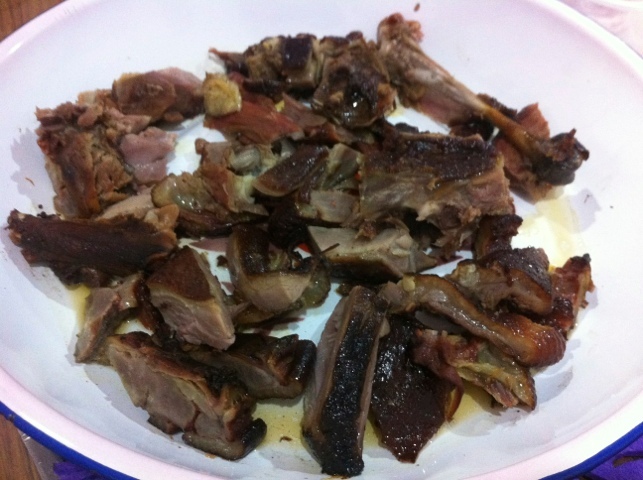 Our New Year’s Eve steamboat was accompanied by strips of smoked duck. These tasty morsels of meat can be wrapped in a lettuce leaf, tempering the strong smoky flavour of the duck and adding a refreshing crunch. This delicious delicacy was definitely a welcome first for us. On the first day of the Chinese New Year we again gathered around the table with Pey Shan’s family for some steamboat but this time accompanied by the pièce de résistance, roast suckling pig! 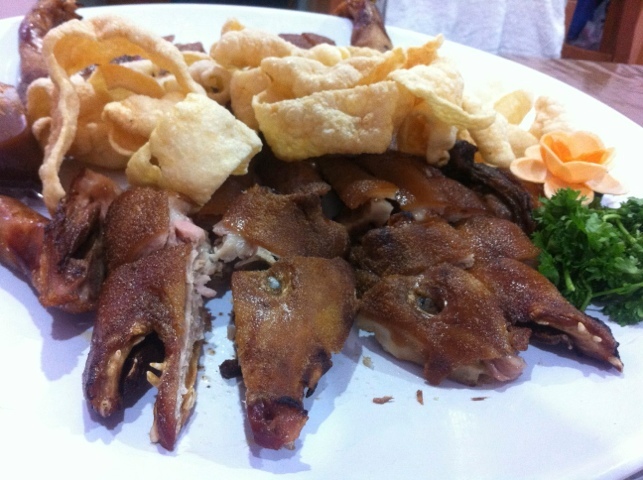 Another delicacy for the occasion, the crispy skin of the roasted piglet is delicious when dipped in plum sauce. Another special dish that we experienced on the first day of the new year was a salad of shredded vegetables, smoked salmon and a sweet sauce, tossed high in the air by all members of the family accompanied by cheerful wishes for the year ahead. Malaysia is a real melting pot of races, something reflected in its food. 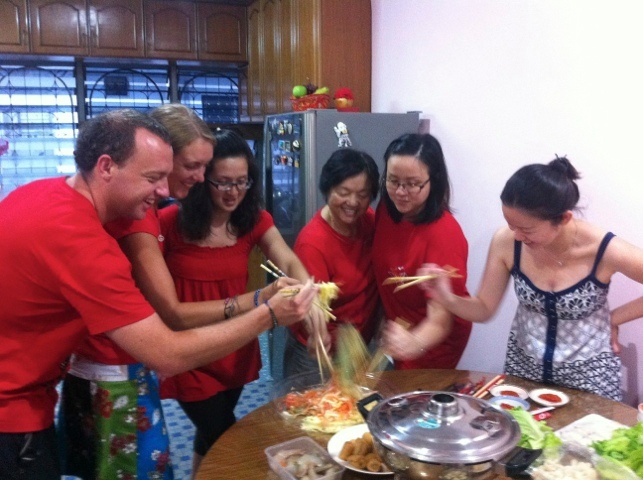 Whilst the dishes described so far have been mainly Chinese, Pey Shan was also keen for us to try some traditional Malay food. To this end we sampled Roti Canai, a flaky pancake type bread, similar to the Indian paratha and enjoyed by dipping in a curry sauce. Another variant (I believe) of this bread was fried and rolled into an upturned cone, draped in strawberry and chocolate sauces, providing a sweet snack or dessert. Laksa is a fantastic curry noodle soup with a good lashing of spice, often served up in hard to finish quantities! 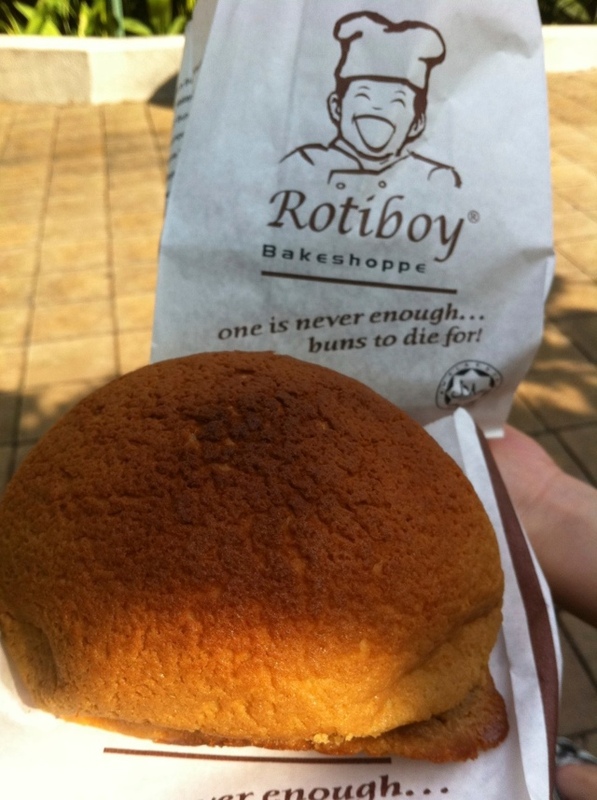 The smell wafting out of a Rotiboy stall promises that a treat is in store. These scrumptious little buns are best sampled straight from the oven, with a sweet crunchy outside giving way to the soft fluffy interior and molten butter centre that will always leave you wanting more. The best hot chocolate in the world. 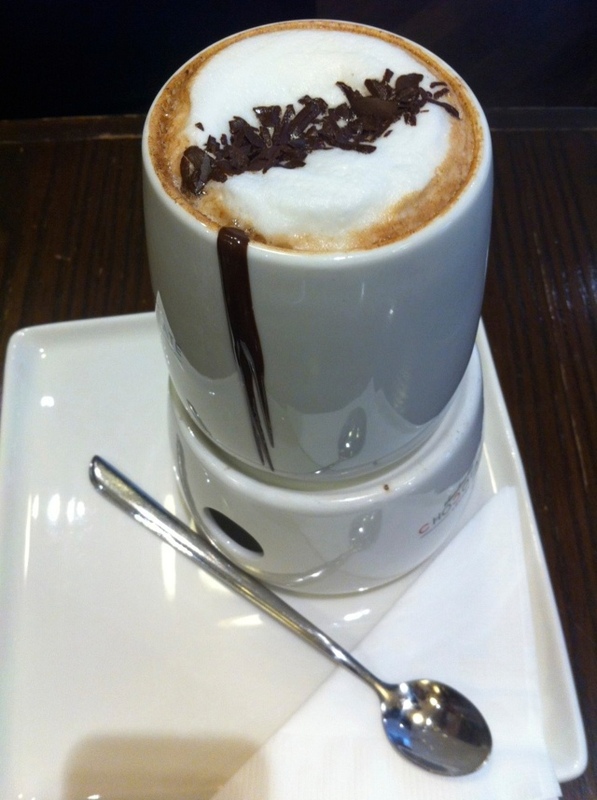 There’s really not much more to say as words simply will not do justice to this mug of chocolate heaven. I’m just sad that this chain originating in New Zealand hasn’t made it out to Europe yet! 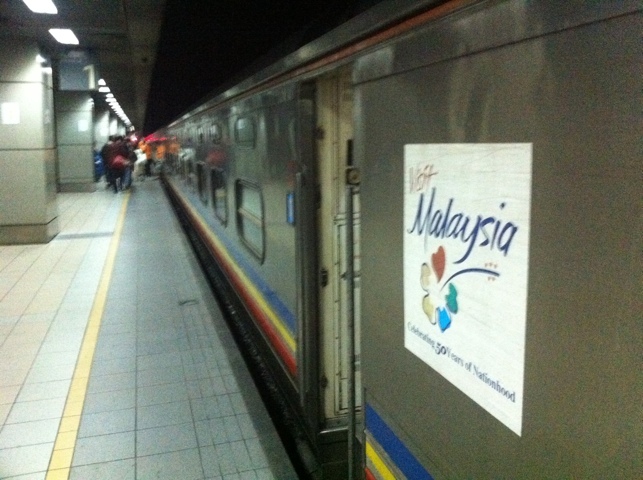 It’s just before seven am, and our train is currently shuffling it’s way through the suburbs of Kuala Lumpur. We’ve been travelling for two days without a break now, and we’ll be pleased to finally get there! Since we last slept in proper beds, we’ve taken four ferries, three minibuses, a coach, and two sleeper trains. Its been quite a journey! Our final couple of days at Koh Lanta were spent enjoying the sun and dodging the occasional torrential downpour. Running out of the sun lotion we’d brought with us, and keen to save a few pennies, we thought we’d take the chance to try the non-branded sun lotion. Oh how wrong we were! At half the price of the Nivea, and SPF 25, we went for ‘body moisturising lotion’. It was only while we were on the way out for the day that we realised it wasn’t water resistant, which isn’t exactly ideal when then planned activity is snorkelling. The thick cream was more the consistency of white emulsion paint than what we’re used to, but we went for it and after a day of being a primed canvas for the red of the sun’s rays, and feeling somewhat crisper than intended, we decided we should get something else for the rest of our time on the beach. Next up, coconut oil lotion, SPF 20, of much better consistency, and with a great tropical smell. We spent a little over an hour lying in the morning sun covered in the stuff, before the distinct smell of something frying. Bacon for breakfast? Oh, hang on… We hastily retreated into the safety of our bungalow to face the reality that we’d effectively basted ourselves in cooking oil and then rotated under the solar heat like a sunday roast. We’d been conned for a second time – there was no SPF in this lotion, despite the claims of the packaging, but at least I can reliably tell you that chicken and coconut go well together. So it was with some reluctance that we returned for a third time, to buy Nivea sun lotion. Expensive? Yes! Worth it? We’ll let you know once the sunburn has died down enough for us to brave the sun! 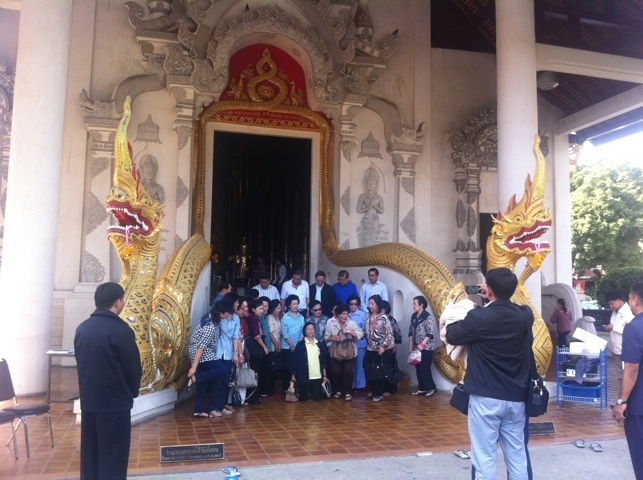 Yesterday we left Thailand after a couple of fun but rushed weeks trying to take in as much as we could. The few things we’ve seen make it stand out as a much more developed place than elsewhere we’ve been, with all the trappings of a modern capitalist society along with the wats and pagodas. Seven-Eleven stores are ubiquitous and practically on every street corner; Bangkok even has British chains like Boots and Tesco (branded Tesco Lotus). Thailand also seems to have a surprisingly progressive (or nanny state, depending on whether you’re a smoker) attitude towards cigarettes. Most indoor spaces are non-smoking, a far cry from elsewhere. Cigarette packets are covered in the most off-putting photos imaginable of the consequences of smoking, and in a precursor to the restrictions due to come into place in the UK, then cigarette packets cannot be displayed at the point of sale, instead being hidden behind a screen. Even some city parks are actually smoke free, something I can’t imagine ever taking hold back home! 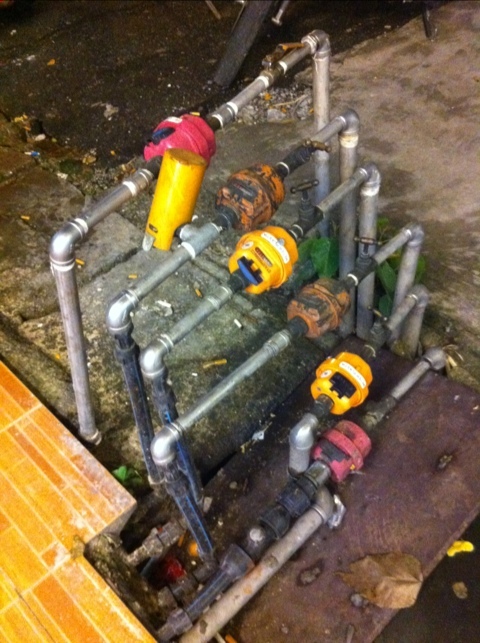 Curiously, Thailand also seems to have an obsession with pipes. Absolutely everywhere, pipes seem to sprout from the pavement or floor to offer up a meter or a stopcock. I know I risk coming across as an obsessed plumber, but we haven’t seen this elsewhere – at every opportunity, there are pipes and dials and taps. I don’t know why, and I’m going to pass up the opportunity for some elaborate metaphor about control or austerity. 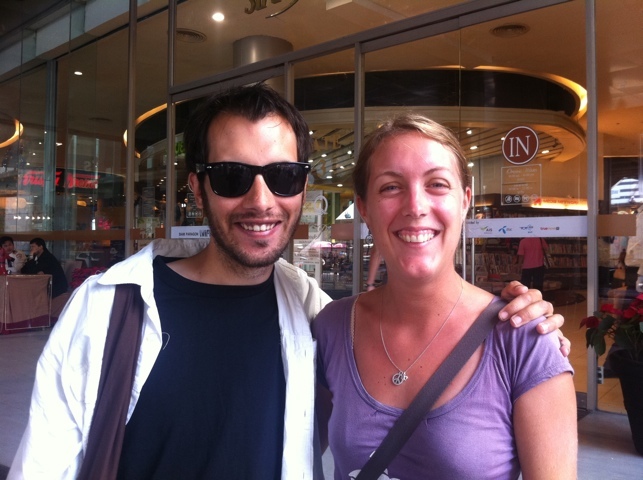 When Laura came to Thailand a few years ago, she came back with the feeling she hadn’t met a single Thai that wasn’t welcoming and friendly. The same goes for our recent experience. Perhaps we’ve just been lucky, but there’s a rare warmth of character and natural friendliness that we’ve tended to find is sometimes replaced by greed in the other places we’ve been to that are quite so tourist savvy. 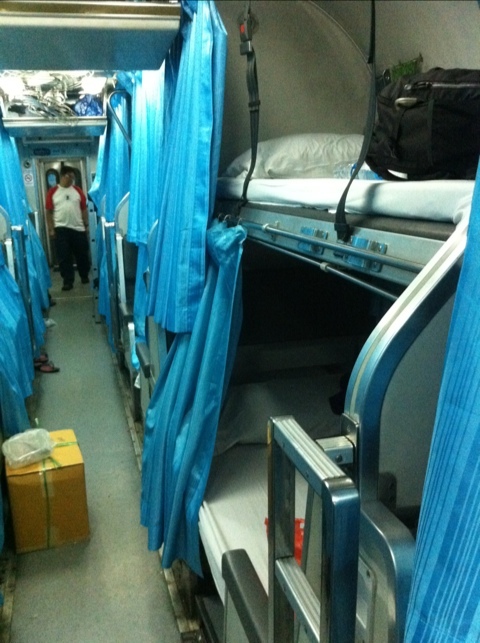 We were due to take the train all the way into Butterworth, Malaysia before changing onto the KL-bound one we’re now on. Unfortunately, the plan came a cropper early yesterday morning due to either a lack of water on the train (according to the first excuse), or, more likely, a landslide. It meant we ended up being minibussed to the border before being escorted across by railway officials and then onto a luxury coach. The way they handled it matched the exemplary approach we’ve found everywhere here, with a level of organisation that the rail replacement buses of the UK can certainly learn from! The buses were waiting for us, they were quick, and there were plenty of uniformed personnel at each step. It was annoying not to cross the border by train, but great to have our opinions of Thai professionalism reinforced as we were leaving. Having taken the train from Bangkok and then a tedious day-long bus journey, we’re in Koh Lanta Noi, an island off the Andaman Coast of Thailand. This is the beach country, in both the book/film (set about 20km west of here) and the lying horizontal sense. We’re here in ‘peak season’, a notch up from ‘high season’ that I didn’t know existed until we questioned the exorbitant prices of all the accommodation. Fortunately after a night in an expensive basic dorm (500 Bhat, or £10 each per night), we’re staying in a nice bungalow a short distance off the beach, which even has a fridge and kettle to tend to our breakfast and lunch needs. It’s lovely to be able to stop briefly again and soak up the sun, even if that means we’re both now sheltering in the shade after becoming slightly more red than golden brown this morning. On our first day here, it rained pretty heavily in the afternoon. We saw the dark clouds sweeping in over the tree covered hills inland, and since we were on the beach, decided to head for the sea to see it through. I’ve heard people describe the sea as ‘boiling’ in a storm but never quite understood. Standing there as the heavens opened, it was more like the sea was carbonating around us, an effervescent bubbling of translucent blue. The tiny falling raindrops were themselves almost imperceptible and certainly invisible; far more significant were the upward rebounding splashes from the salty sea as each raindrop hit, their speed meaning that much more water leapt up than was coming down from the clouds. It was a strange taste sensation too – turn your head downwards for salt, and upwards for the sweetness of fresh water. 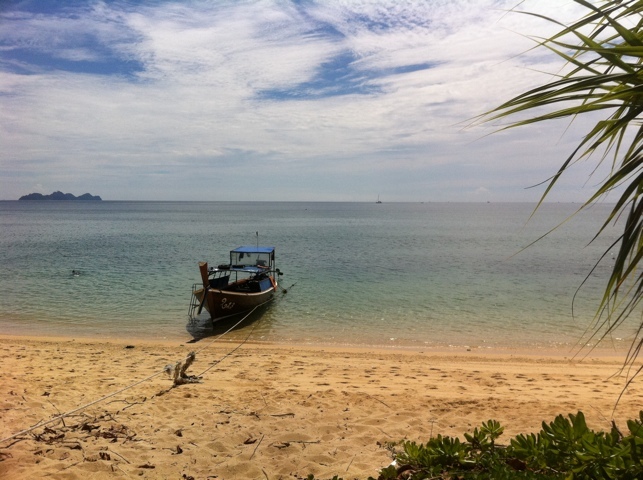 Yesterday, we went on a boat trip to go snorkelling and swimming at ‘four islands’, an hour south from here. I’ve never snorkelled before; it was fantastic to catch a glimpse of life beneath the waves, even if the coral reef where we were was sadly dead. It was one of those truly eye-opening occasions (albeit tempered by a face mask), with alarmingly spiky brown sea urchins nestled in the rocks beneath, and thousands of little fish swimming around, some solo and in fluorescent yellows and electric blue, others like tadpoles swimming in shoals in their hundreds around us. At one point, one of them had a nibble of my leg, but it seems it wasn’t a piraña, as I’m still here to write this! There were also jellyfish in a bewildering (and concerning) range of sizes. The first one we saw was football sized and a see-through shade of light blue. Having mastered our underwater signals, we both indicated we should avoid it (pointing at it with expressions of sheer horror on our faces), and later on, that there were actually quite a few around to be careful of (communicated by swimming quickly back to the boat and climbing out). With the sun shining through the surface creating shards of rippling bright light down to the sea floor, it was quite a spectacle as the jellyfish came into view through the clouds of dust. Some had a purple edge to their body, which was about an inch in diameter, with a long trail of tentacles behind. And then when you looked closer at the clouds of dust particles suspended in the water, you realised that many of the particles were actually also jellyfish, tiny creatures only a few millimetres long, in a swarm of thousands together. It was definitely time to get out, as a sting to my arm soon confirmed! Inside Emerald Cave. The black hole behind us is the only way in and out. The day was also a chance to visit Emerald Cave. 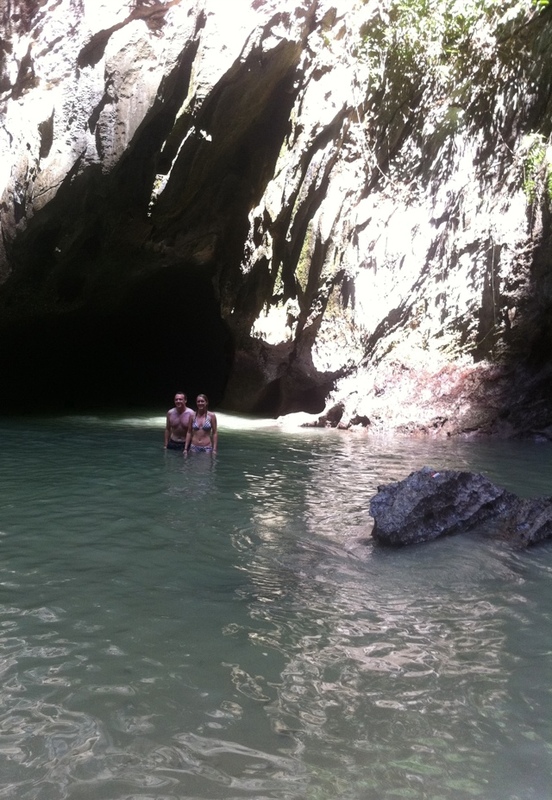 Jumping from our boat, we were led swimming by our guide into a pitch black cave that opens onto the ocean. Fortunately he had a torch that worked! After about 80m and a number of corners, we emerged onto a secret beach in the middle of the island, surrounded on all sides by high rocky cliffs and with just the watery tunnel as a way in. Fittingly for a secretive cave, this used to be used by pirates to stash their ill-gotten gains before they were sold on the mainland. Unfortunately we left our cutlasses, rum and even kazoos at home, so we just had to make do with a couple of photos and leaving our blog address scrawled in the sand. I’m not quite sure that these words match up to the treasure troves from previous visitors though! 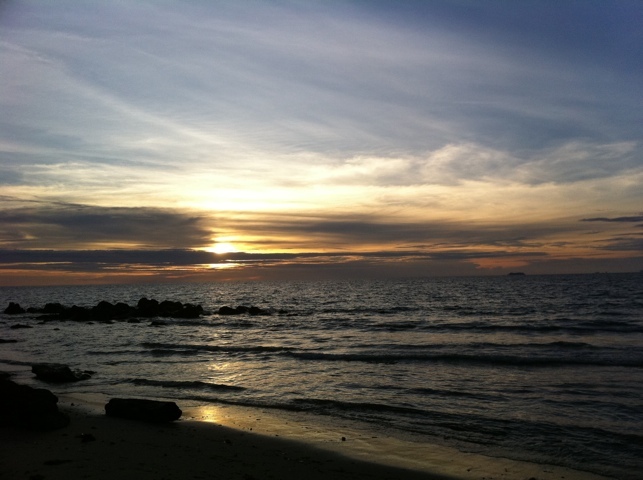 Sunset from Phra Ae Beach, Koh Lanta. You can see Koh Phi Phi in the distance on the right. Last night we watched the beautiful sunset sitting on the beach here, a fitting image for what’s soon approaching – the setting sun on the first part of our trip. We looked out at a picturesque scene filled with colours that echoed our travels so far: the white crests of waves like the snow of the Himalayas; the bright oranges of Buddhist monks; the deep blue sky of Rajasthan in India; the yellow sand of the dunes in the desert; and the peaceful lapping of the waters edge that we found throughout Laos and Cambodia. Appropriately, there were some dark rocks cutting through the surface, silhouetted poignantly against the reflections of the stunning sun – a metaphor perhaps for the half-hidden horrors lurking beneath the surface in Vietnam, or Laos, or Cambodia – or maybe just a reminder that shipwrecks can and do happen in the most idyllic of settings. Even here in stunning Southern Thailand there are reminders of recent horrors – in this case, of the 2004 Tsunami which wrought destruction globally. Every few hundred metres along the road is a sign with directions for the evacuation route, and huge sirens stand tall on towers over the prominent beaches. Of course, this is what was required to ensure that all-important tourism returned to these islands after the deaths of holidaymakers; one can’t help but wonder if a system is quite so well established in the multitude of rural coastal communities where whole towns and villages were decimated by the destruction that day. And of course the tsunami was globally visible, played on the world’s TV screens via the camcorder scenes of destruction from beach resorts. The threat of climate change, which will affect many more lives if estimates are correct, is one for which the warning sirens started sounding many years ago, but where we all seem to still be on the beach, admiring the view while on our cheap flight holidays – and indeed our round-the-world trips. 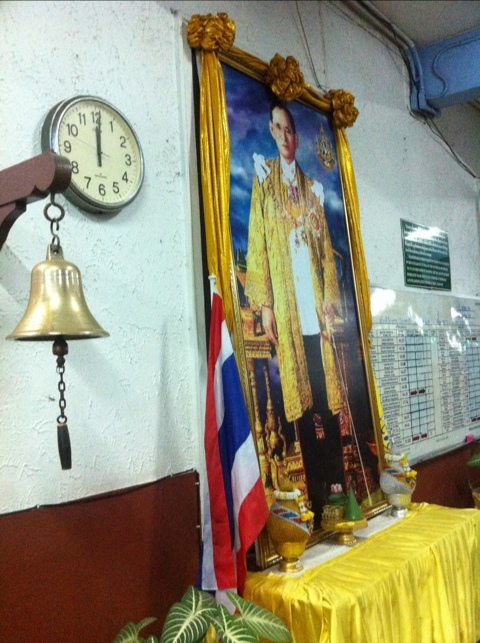 So, Thailand, eh! When we sat in an ice cream parlour in Ho Chi Minh City and frantically worked out our South East Asia schedule on a paper napkin, we weren’t sure if we’d have time to make it here before heading home. But here we are! Due to the shortage of time (yes, five months is not enough! ), we’ve rushed around a bit since getting here, spending a quick day in Bangkok before taking the night train to Chiang Mai and another night train back again. As well as seeing the sights, we’ve been able to meet up again with the lovely Mr Michael Carroll and catch up over Pad Thai, desserts and Geocaches. The two of us with Mike. No sunset this time! Not sure why we didn't get someone to take a photo of all three of us. 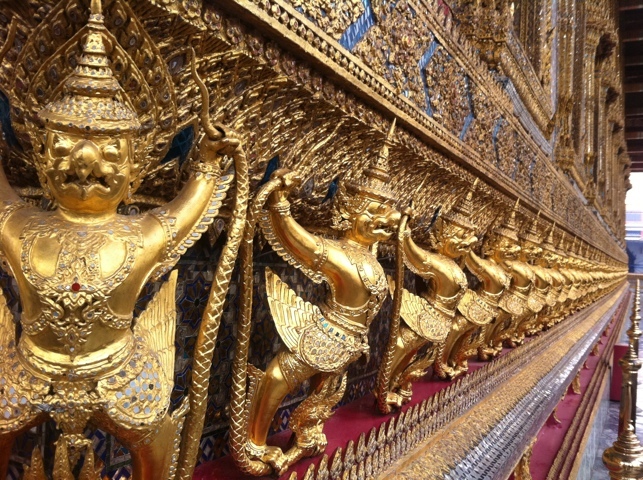 Bangkok is a whirlwind of a modern city, especially compared to elsewhere we’ve been in Asia. Its skyline of glowing skyscrapers and light railway in the form of the ‘Skytrain’ firmly marks the city as the most modern-feeling place we’ve been since Beijing. It’s interesting to see how the traditions of old nestle with the structures of new, with the spires of gleaming golden wats jostling for space alongside the reflective glass of the latest new towering office block. It does seem to just about work, with the old and the new coexisting together. 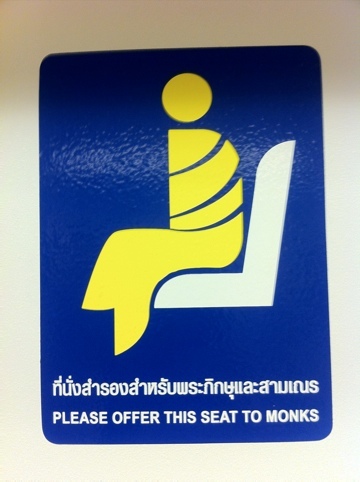 Fantastically, even the Skytrain has spaces marked ‘Please offer this seat to monks’, alongside the more recognisable icons for the elderly and pregnant. Alongside the glass and air-conditioned elevated trains, the other thing that really comes across is just quite how wealthy Bangkok is – or at least the parts we visited. Elsewhere in South East Asia, we were impressed by the golden decoration of the Wats, but here it is truly dazzling, huge sculptures shimmering with fresh gold leaf and gold paint that make you realise how central to society religion is here when compared to the quiet decay facing some buildings of worship back home. We visited the Grand Palace, an absolute spectacle of towers and ornate buildings, even with its own large model of Angkor Wat. 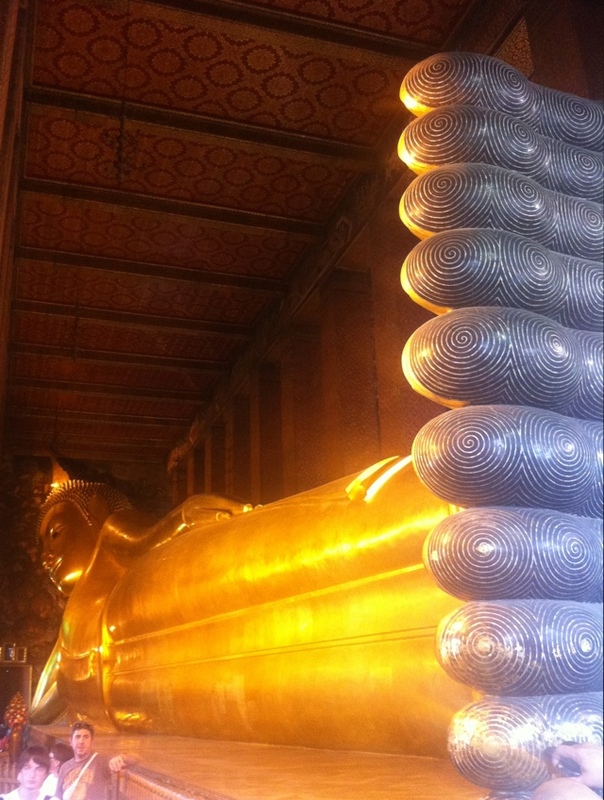 We also popped in to see South East Asia’s largest reclining Buddha, an enormous golden sculpture that’s so big you can’t fit it in one photo when inside its pillared building. Laura tells me she and Patrick did somehow nearly miss it last time – I can only assume it has since grown in size due to all the layers of gold paint! 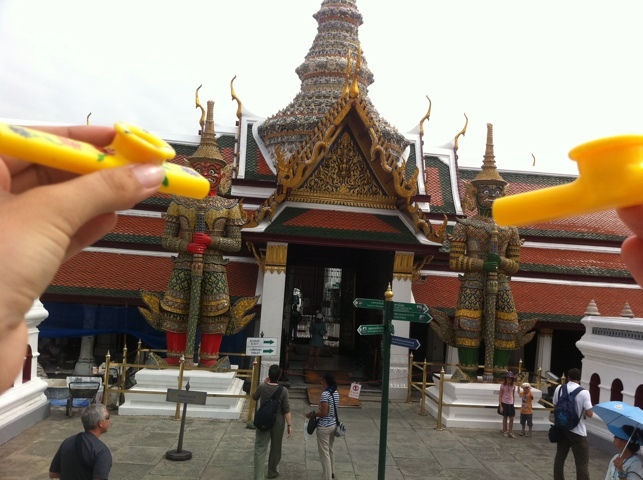 Kazoos at the Grand Palace. I blame Laura! beach here! Fortunately, we just passed through to find some Geocaches, and were able to retreat to our fantastic and cheap hostel in the more authentic Wong Wian Yai area. It’s strange to think that only a couple of months ago, much of the city was underwater from the flooding – there’s very little evidence of this around, save some piles of sandbags surrounded by offerings apparently as a sort of shrine. 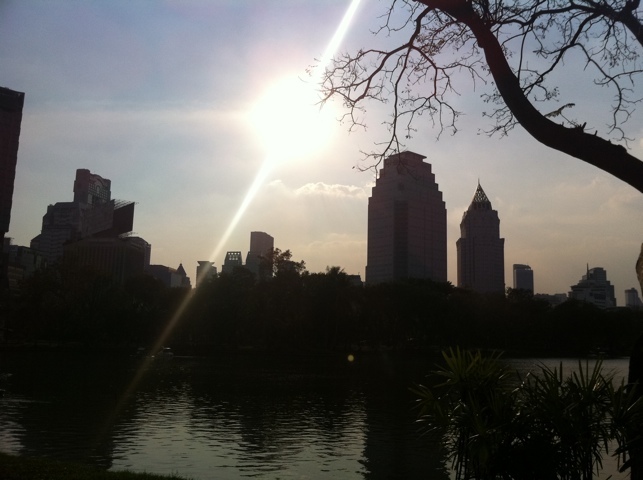 Mike took us to see one of his favourite spots in the city, the refreshingly calm Lumpini Park. Although there was a disappointing lack of ice cream sellers, it has two gorgeous lakes in the middle, and amid the joggers and pedalos, the park is home to a collection of monitor lizards. 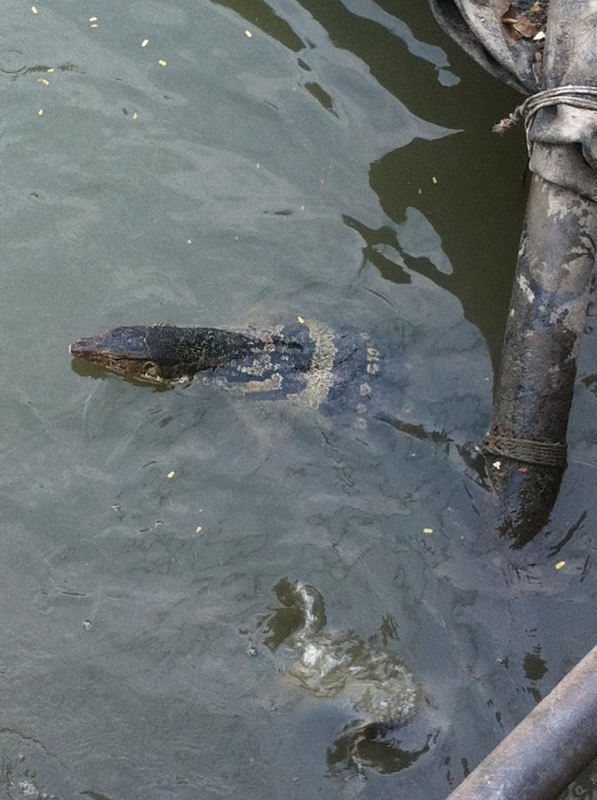 I’m glad we’d been warned in advance, because they look scarily like crocodiles, and are absolutely huge, some of them 1.5m in length – and roaming free! We’re assured that they don’t eat humans, but I wouldn’t have liked to be around after it got cool enough for them to leave the confines of the lake. 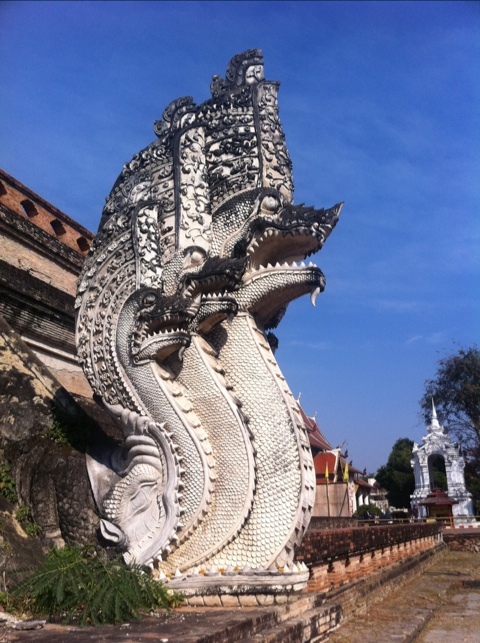 In contrast to Bangkok, Chiang Mai is a different beast entirely – perhaps a colourful butterfly to the capital’s ferocious reptile. The old city is surrounded by a crumbling former wall and a fountain-filled moat, and the streets are alive with markets and colourful wats instead of noisy traffic. was hosting a temporary exhibit – a sacred Buddha Tooth Relic. There are quite a few Buddhas, and they had quite a few teeth, so we’ve seen a couple of these over the course of our travels – but this was certainly the most highly venerated, with the wat set up to receive crowds of visitors and a hall of monks sitting by the relic itself. 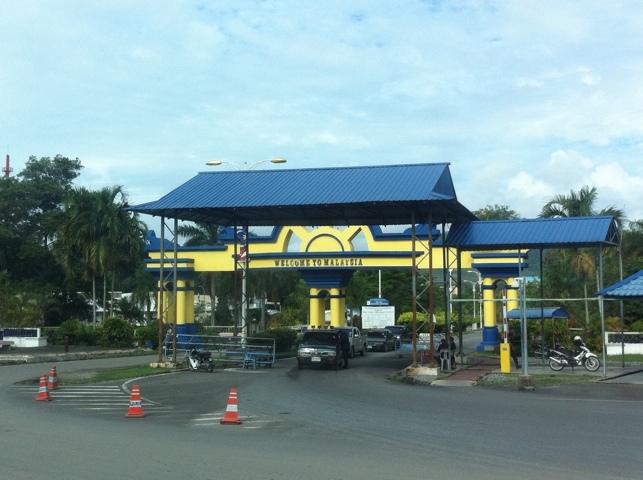 The security was also surprisingly high – armed guards outside and various police and army trucks around. It was then that we realised we’d got there just as a VIP and her entourage were being shown around. Like politicians in the west do with babies, she dashed in for a quick photo call with the relic, and then headed out on parade around the grounds. We watched from a distance while her armed guards eyed us suspiciously – we still have no idea who she was. Every time Chiang Mai has come up while we’ve been planning our trip, Laura has danced round and round chanting the magical words ‘Night Market! Night Market!’, and so predictably we spent our first evening engaging in the dark arts of shopping and haggling on a ‘walking street’, which turned out to be some 5km of stalls, with the courtyard of almost every wat along the way converted into a food court. Unfortunately Laura’s trendsetting style came back to bite her, as they didn’t quite have the range she remembers from last time – but needless to say, we didn’t leave empty handed! 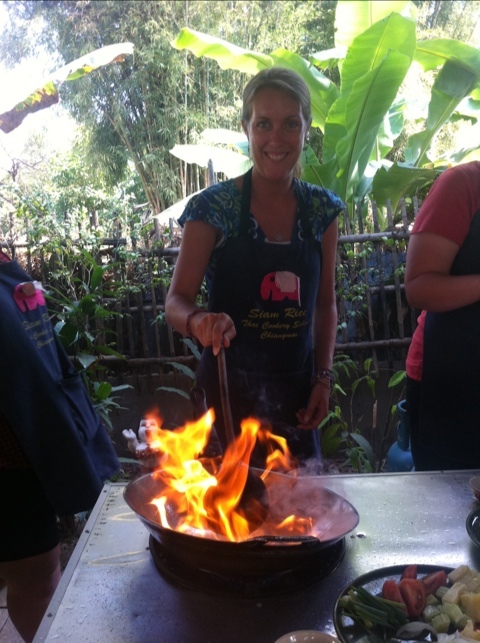 Chiang Mai is the place to do a cookery course in Thailand, and after our successes in India and Cambodia, and our love of the local food, we had to go for it. 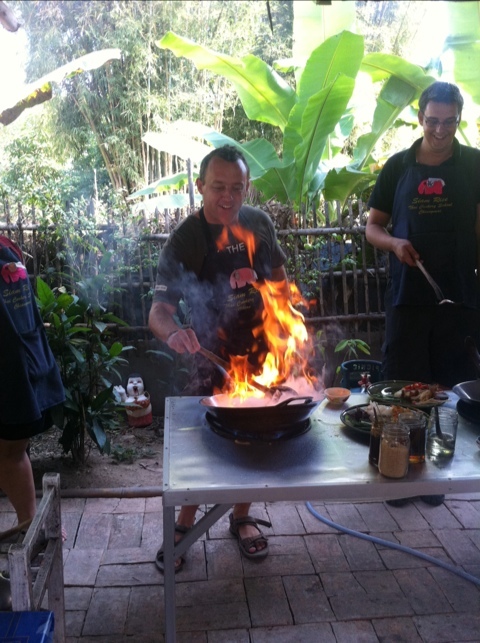 We had a very successful (and filling) day differentiating our Drunken Noodles from our Pad Thais and Jungle Curries from Massamuns, and they even taught us how to flash the hot oil on fire for show – although I’m not quite sure it will work indoors! 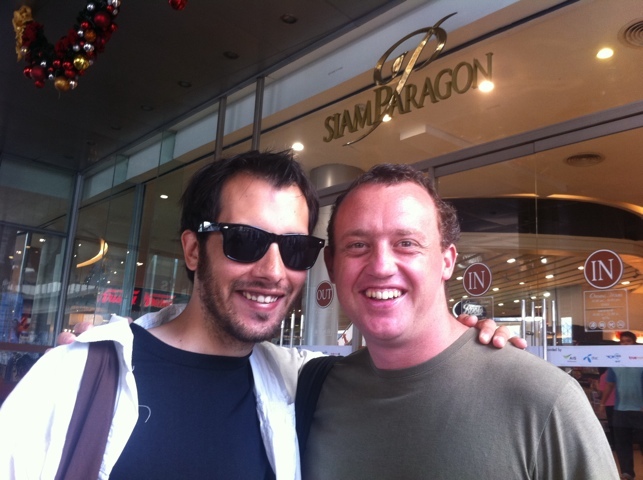 Look out for Laura and Simon’s culinary treats on our return. We were hoping to go elephant trekking on our final day, but somewhat short on time, we were unable to find somewhere recognised as caring properly for their animals that fitted with our schedule – and so we turned to culture instead. 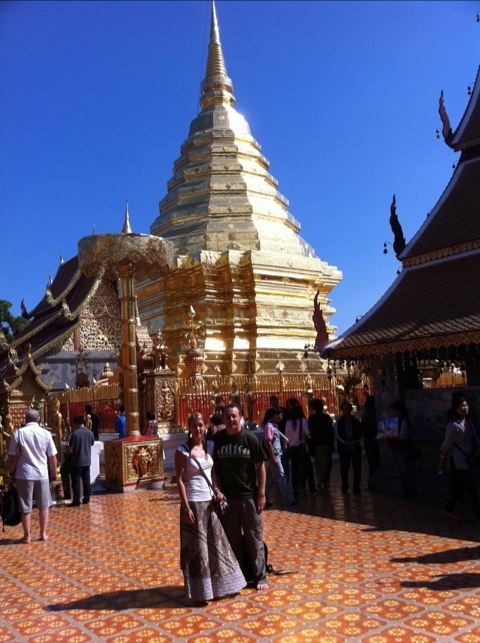 Doi Suthep is a fabulous (golden, glittering, ornate, etc) wat up on the hilltop overlooking the city, affording wonderful views and perhaps more memorably for us, the image of an elderly monk dressed in orange sitting on a bench chatting away on his mobile phone. After a lovely morning up there, we popped into the City Museum for a taste of the history of the town – and that’s where it got a little more odd. that moment on, we could see through the polish to the poorly presented museum underneath. We sat down to watch a subtitled film, only for the video compression to be far too high to be able to make out the words on the screen, a mangle of digital blocks where the letters should have been. We played guess-the illegible-words for a while. The final straw that sent us into a giggling mess was an interactive computer exhibition on the King. It was simple and childish really, but it’s amazing what a typo can do to your sense of reason when already on the edge. One clicked on each event in the King’s life, and then clicked a button to return to the prior page. Except instead of ‘prev’, the typo said “perv”, and the way it was positioned, it seemed like we were being forced to accept this label in judgement on the facts about the monarchy presented on the screen. We burst out laughing. In a country where the King is very highly revered, was our sense of humour an act of treason? Giggling, we didn’t wait to find out and left swiftly – but it was certainly the most entertainment we’ve had in a museum for a while!